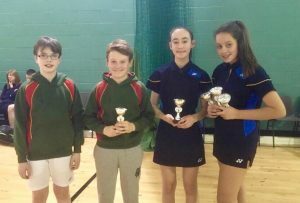 Jordanhill had a very successful day at the badminton championships held on Saturday 26th January 2019. Iona Campbell won the u14 singles and Iona along with Mya Mcquade claimed the U14 Doubles title. Iona completed a hat trick by winning the mixed doubles with her partner Robert Phillips. Robert reached the semi-final in the singles only to lose to the eventual winner. Mya came second in her pool in singles. Oliver Hicks put in some commendable performances, particularly bearing in mind that both he and Mya still have next year to compete in this age group. Congratulations to all of our pupils.